French Emblems: Emblem: Principum opes, plebis adminicula. The wealth of princes is a support for the people. Errantibus circumligat hedera sequax brachiis. Mentisque constans firmitas viret perenniter. The Pyramids, eternal monuments of the Egyptian kings: The clinging ivy winds round them with wandering branches. The needy populace is supported by the secure wealth of its kings: And constant strength of mind flourishes for ever. Marcent lucernae, sol propinquat, non tamen vocas. ut, praeter Solinum, Ammianus scribit lib. 22.
textu patrocinii in se corrivant, atque emungunt. The Pyramids, which Pliny calls the Egyptian kings’ vain and foolish display of wealth, [p.90] were huge and crazy masses of substructure, covering several acres of ground, whose sides rise from a (normally) four-cornered base to come to a pinnacle, are so called because they rise to a point in the manner of a flame. Their soaring height that gradually diminishes to a point, also destroys shadows, as Ammianus writes in book 22 (as does Solinus). We are told by the geographer Strabo that they were the monuments of the kings of Egypt, and held to be one of the seven wonders of the world. 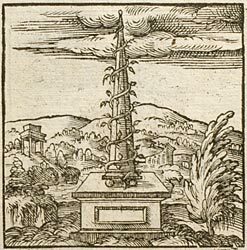 Because the four-sided square is held (on the authority of Galen) to be truly the firmest and most stable of figures, for this reason I believe that the fortunes of monarchs or kings can be fittingly compared to it - or even those of men of steadfast spirit, such as Cicero portrays Quintus Catulus to be, whom neither storms of peril nor rays of glory could ever deflect him from his course, either by fear or by hope. Ivy is very suitable for this emblem for one reason, in that it is incapable of holding itself up and creeping forwards, without its using the support of something to prop it up, and it strengthens itself in its weakness with its tendrils. Such is the position of the common people and the lesser sort of men, for whom the wealth of princes is both a support and an enrichment. Nor is the lively and evergreen colour of this plant inappropriate in our emblem for a second reason: [p.91] inasmuch as when a great-spirited and strong man overcomes all human weakness and bears himself with unbowed spirit through every turn of fortune, his glory will vie with eternity, and will be eternally victorious. Clearly different from this is the rationale behind showing the ivy climbing a tree, as it is accustomed to take all the tree's sap and strength for itself and in the end it kills it: which fits those who appropriate the wealth of others to themselves under the name and disguise of patronage, and cheat them of it. [Ammianus] Marcellinus, however, in bk. 15 made a different comparison with ivy, that is, of rich men, denounced before the Emperor, invoked the protection [lit. knocked at the door] of more powerful men, and clinging to them like ivy to tall trees, bought forgiveness through supplications. There are those who, misrepresenting the meaning of this emblem, for the purpose of whipping up jealousy against a certain important man who makes use of this symbol, twisted its sense in another direction, as if he held the king of the Gauls [i.e., France] surrounded and entwined as if with ivy, so that no one could get an audience with him without his consent. But what is that other than to corrupt the real meaning of the emblem, and to pervert it, and to deprive it of its [true] spirit? 1. For Plotius, see Emblem X, n.1 ([FJUb010]). Chris Heesakkers has pointed out in his edition of Junius (p. 48) that this is not, in fact, from Plotius, but Servius, Decentum metris. 2. i.e. the word ‘pyramid’ derives from the Greek pyr, meaning ‘fire’ or ‘flame’. 3. Caius Julius Solinus was the third-century author of the Polyhistor, a work largely cribbed from Pliny’s Natural History. 4. Ammianus Marcellinus, Res Gestae, 22.15.29. ‘Destroys shadows’ refers to the belief that the sun is so high in the sky that no part of the pyramid is in shade. Ammianus takes this from Solinus’ De mirabilibus mundi, 32: “Spreading out beyond the measure of their shadows they have no shadows.” Junius prefers Ammianus’ striking image to the more easily comprehended language of Solinus. 5. ‘Perpetuo victura’ is a pun: victura is the future participle both of vivo (‘I live’) and vinco (‘I conquer’), cf. Ammianus Marcellinus, 14.6.3. 6. Ammianus Marcellinus, 15.2.9: Junius used a text which printed precibus (prayers) rather than pretiis (prices), so a slightly different meaning..
7. The ‘certain powerful man’ mentioned is undoubtedly Charles, Cardinal de Lorraine, who used this symbol (see precisely this image in Paradin, ‘Te stante virebo’, ([FPAb042]). The Cardinal, already very powerful in the reign of Henri II, became virtually unstoppable during the reign of his niece’s young husband, François II (1559-60).